Here's a batch of 10 new screenshots for Dead Island: Definitive Collection showing the remaster work that has been made for both titles. The publisher listed these improvements among others: high quality textures, new lighting system, physically based shading, better anti-aliasing, improved-quality game models and online 4 player co-op. 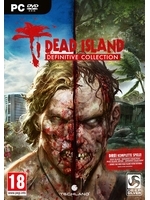 The bundle, containing both remastered titles and arcade game Dead Island: Retro Revenge, is launching on May 31 (PS4 preorder now available) and will be sold (retail and digital) at $39.99. The two games will also be avaialble separately for $19.99 each.